Happy Valentine’s Day! I do have to say, we don’t usually make a big deal out of it, but we did enjoy an event at near-by Raylan Vineyards this weekend. Wine, truffles, food were all a part of the festivities and you don’t need to ask me twice if I want to go! We took the puppies after their grooming day, in their red bandanas, and I was so excited to be out with them sitting outside! One step closer to nicer weather, perhaps. I am hoping to do some Vineyard reviews and posts on the blog this year, as I have mentioned in the past, we have 90+ vineyards in the NC area, plenty around us and we enjoy bopping around. I had worn red last week, and thought about wearing some berry and brown tones. Maybe I was thinking of the truffles or cherry cordials when I put together this look! ha. 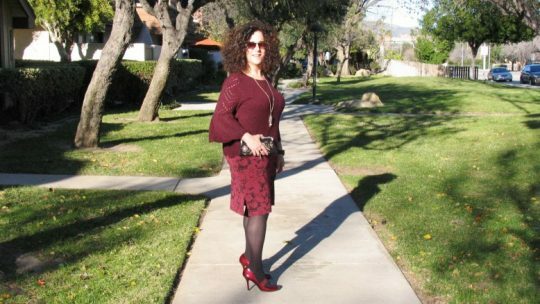 Anyway, as you know my fondness for combining textures in the fall-winter is present here, as I began the look with a brown wrap blouse and berry toned lace skirt from Ann Taylor, I bought a few years ago. 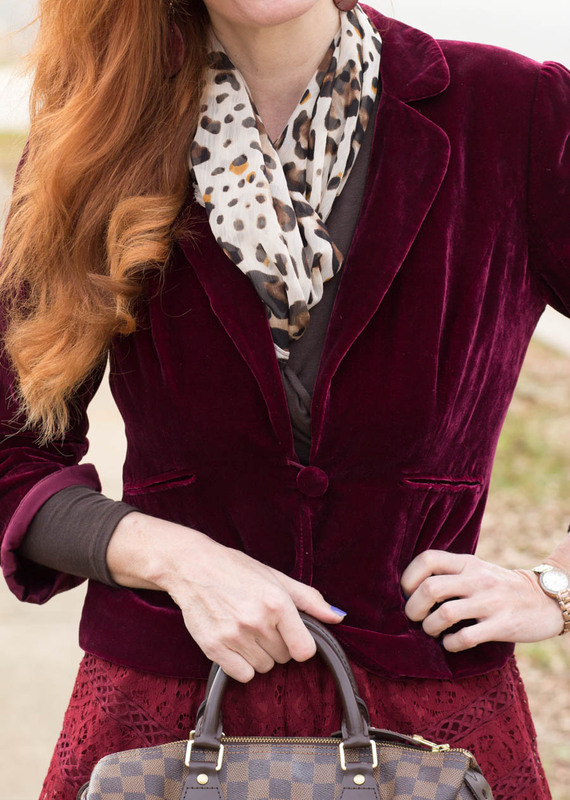 I decided to add my burgundy velvet blazer, I purchased on Poshmark, for a mere $20, if you missed the post on how to shop there, you can read it HERE. I added some brown textured tights and wanted to wear block heels, so these ASOS brown suede pointed toe heels made an appearance. Last item became the leopard brown scarf for an addition of print. In he near future on the blog, I hope to share with you some casual looks as I know some of you may wonder if I own a pair of sneakers! Everyone has to dress more casually from time to time and if I am not feeling well, I don’t always dress up. So I have some slip on sneakers and several pairs I have recently bought.. so I hope to bring that to you soon. 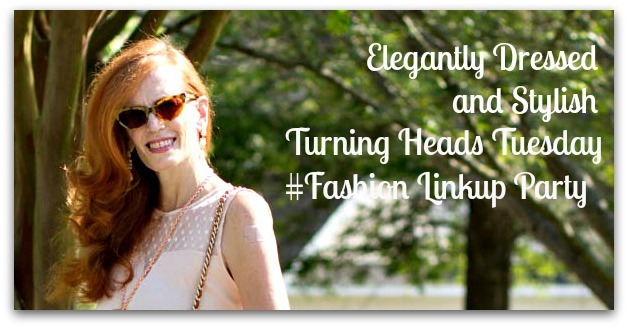 I want to thank you all for participating in the Turning Heads Linkup last week, we had a great turnout! As per usual, please comment on 2 posts per blogger. Let’s keep it going! I truly enjoy seeing your looks each week! Most clicked this week: Rena of Fine Whatever Blog, is wearing this lovely berry colored outfit in wine and roses. Pinterest Pic of the Week: Love this emerald green dress on Carrie from A Stylish Fit blog. Gorgeous color combinations. So rich. And it does make me think of cherries and chocolate! Lace, velvet, leopard print. What more can a gal ask for? Beautiful! Beautiful skirt! The details are phenomenal. Love your style. Thank you Nicole, I love a great blazer! This a very pretty look! Love the combination of lace and velvet! You look fabulous! You can’t beat velvet and lace for a romantic Valentine’s outfit. You look lovely. I had a beautiful red velvet dress when I was little girl and have been trying to find one. Head to toe STUNNING! I love your skirt! Hi Jess, I am finally back to doing my favorite link ups, have had a lot going on recently. Anyway, love how you paired the brown tights with the burgundy and wine colors, LOVE the color mix so much! When I think of lace I think of you!! Lace and velvet , always favourites, and you wear wear them so beautifully. Your trip to the vineyard sounds fun , I’m sure your newly clipped sweeties enjoyed the day too. Take care Jess . Oh how wonderful to be able to dine outside !! …it is still weeks (if not months) before that is a possibility here in Toronto. Sounds like you all had a great time!! I love the way you mix colours, patterns and textures! Looking fabulous my friend… Hugs, C.
Oh, such rich colors and amazing fabrics! I love this outfit Jess. These rich berry tones are beautiful! I love your velvet blazer. I’ve been wanting one all Winter but haven’t found the right one yet. You’re very lucky having all those vineyards nearby! Loving the bold and rich colors. The blazer and skirt is gorgeous and looks perfect on you. Happy Valentine’s Day beautiful lady. Loving the layered burgundy, lady! 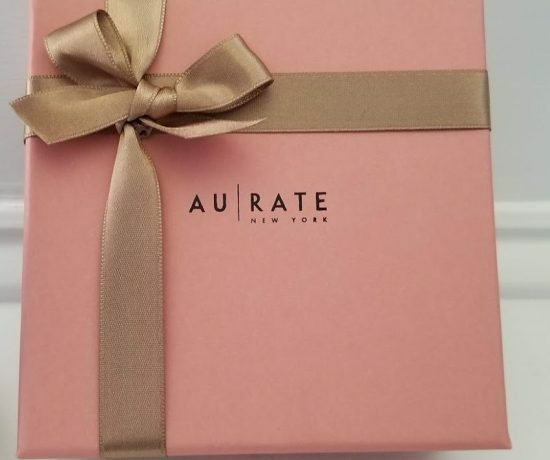 Great for Valentine’s! Love that gorgeous blazer! What a great Valentine’s Day outfit! Love this mix of deep, rich colors and varied textures! It sounds like you enjoyed a wonderful weekend at the vineyard and it was nice to feel a bit of warmth in the air. Happy Valentine’s Day! I seriously love these colors on you! And so fun with the tights paired with it. Happy Valentine’s Day! Looking lovely as always, Jess! Adore that velvet blazer!!!! Lots of lovely texture in your outfit, the blazer is gorgeous and so are the shoes. Thanks for the link up! You are such an inspiration! Your creativity is endless!! I’m so glad you describe your ideas…like berry tones; it helps the rest of us look at our wardrobe pieces differently too! Gorgeous outfit once again! Love this velvet and lace look!! Your blazer is stunning! You look gorgeous as always Jess! Such pretty color hues happening in this look! Love the combination of velvet and lace. Great minds think alike. I am also wearing burgundy for Valentine’s today with my daughter (on the blog). Your dress and blazer are so pretty. This dressy outfit turned out beautiful! Beautiful outfit, Jess! I love all the different textures, and the colors are so beautiful and very you! Looking fabulous! What a gorgeous outfit! I love that color and all the textures! You look so beautiful and ready for Valentine’s Day, Jess! The hubby and I have been so busy and/or sick that we haven’t planned a thing! I do have a few little presents for him though. Loving the texture in this look, Jess! You look so classy and elegant. Thanks for hosting the linkup and Happy Valentine’s Day! Love your chic velvet blazer, great look for V-day! Happy Valentines Day Jess! I hope you are feeling a little better today. Love vineyards and your velvet blazer!! Loving the brown and burgundy Jess. The velvet jacket is beautiful and that shade is so flattering on you ! Thanks for the link up, Jess…have a great week! Jess, berries and chocolate make for a tasty treat and an inspired color combination. You’ve put together another winning outfit. I adore all of the details of texture and pattern in your look but it’s the leopard print scarf that takes it to the next level of greatness. And how awesome to find out that my post from last week got the most clicks. That makes my day. Thank you for the shout out and for hosting the link up. Sounds like you had a great weekend! And I love all of the textures in this outfit!